Native habitats are the fabric of natural ecosystems. 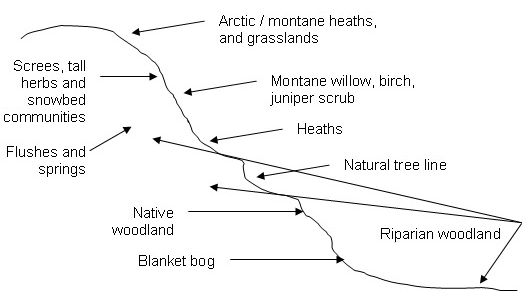 To achieve wild land ecosystem health the full range of habitats from mountain top to glen or valley floor should be present and self-sustaining. In many cases, this will mean managing grazing and trampling impacts, principally by deer and sheep, to enable habitats to regenerate and fully occupy their niches.